In less than eighty years, aviation has grown, boomed, and declined on Long Island. However Long Island has helped transform aviation from a dangerous sport to a viable means of transportation. It has also produced a large portion of the nation's aerial arsenal in time of war. The many record-setting and historic flights that transpired here, and the many aviation companies that developed here made aviation the integral part of our world that it is today. Long Island was geographically a natural airfield. The Island itself is ideally placed at the eastern edge of the United States, at the western edge of the Atlantic Ocean, and adjacent to America's most populous city. This made it the ideal focal point for most transatlantic and transcontinental flights. Furthermore, the central area of Nassau County, known as the Hempstead Plains, was the only natural prairie east of the Allegheny Mountains. This proved to be an ideal flying field, treeless and flat, with only tall grasses and scattered farm houses. The Hempstead Plains were to be the scene of intense aviation activity for over fifty years. The earliest form of flight by man was ballooning, and this primitive type of travel also made its presence known on Long Island. Long Island's most famous balloon flight was an unsuccessful transatlantic attempt by W. H. Donaldson in 1873. 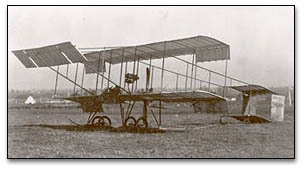 By 1896 the first recorded aircraft flight took place on Long Island, when a Lilienthal-type glider was flown from the bluffs along Nassau County's north shore. By 1902 gasoline-powered airships were flown over Brooklyn. Powered flight had come to Long Island to stay. By 1909 the first daring flights were made from the Hempstead plains in the central part of Nassau County. Because the flat, open landscape made a natural airfield, famous aviator Glenn Curtiss brought his biplane the "Golden Flyer" here. By 1910 there were three airfields operating on the Hempstead Plains, and Long Islanders were now building their own airplanes. Several flying schools and aircraft factories also sprang up and Long Island became the center of the aviation world. By far the most important aeronautical event on Long Island up to this time was the 1910 International Avi ation Meet at Belmont Park. The greatest aviators from all over America and Europe came to Long Island to show their latest flying machines, race, set records and win prize money. A similar meet was held at the Nassau Boulevard airfield in Garden City in 1911, and the first official air mail flights in the United States were the featured events. Also in 1911 the first transcontinental flight occurred when Cal Rodgers, in a Wright biplane, flew from Long Island to California in 49 days. During World War I, both Hazelhurst Field and Mitchel Field on the Hempstead Plains were major American centers for training army aviators. Naval aviators were trained at Huntington, Port Washington, and Bay Shore as well. Aircraft building also took firm hold on Long Island during World War I, as military aircraft were built by Sperry in Farmingdale, LWF in College Point, Breese in Farmingdale, and Orenco in Baldwin. The period between 1918 and 1939 is known as the "Golden Age" of aviation. During this time, flying went from being a dangerous sport to becoming a major commercial industry. About twenty aircraft manufacturers were established on Long Island during this period and many of them made major contribu tions to American civil and military aviation. In 1919 the first flight across the Atlantic Ocean was made when a Navy Curtiss flying boat, (built in Garden City), the NC-4, flew from Long Island to England with two stops in between. The Atlantic had been conquered by air at last. Later in 1919 the British airship R-34 also complete a round-trip crossing of the Atlantic from England to Long Island. During the Golden age of aviation, speed, distance and other record-setting flying events became popular. The known limits of flight were expanded regularly in the skies over Long Island. In 1923 the first non-stop flight across America was made from Long Island to California. New speed records were also set at the National Air Races held at long Island's Mitchel Field in 1920 and 1925. During this period major aviation manufacturers were established on Long Island including Curtiss and Sikorsky in Garden City, Sperry and Fairchild in Farmingdale, and Brunner-Winkle in Queens. Thus hundreds of new civil, commercial and military aircraft were built in the 1920s and 1930s. By far the most famous event to have occurred on Long Island at this time was Charles Lindbergh's historical flight from Roosevelt Field to Paris in 1927. This single event revolutionized aviation as nothing else before or since. Lindbergh's flight was followed by many more successful transatlantic flights to and from Long Island. In 1929 the first "blind" flight was also made on Long Island when Jimmy Doolittle took off, flew and landed a plane solely on newly developed instruments at Mitchel Field. By the early 1930s Roosevelt Field was the largest and busiest civilian airfield in America with over 150 aviation businesses and 450 planes based there. In 1937 the first regular commercial transatlantic airline service in America was begun at Port Washington as huge Pan American Martin and Boeing flying boats departed and arrived regularly at Manhasset Bay. During World War II, locally built aircraft clearly helped America win victory as many aspects of American fighter operations were dominated by Long Island built aircraft. The demands of war brought tremendous growth in the aircraft industry on Long Island and by 1945 over 100,000 people worked in the industry here. Two large companies dominated the Long Island work force during the war, Grumman and Republic. Grumman, founded in 1930, produced primarily Naval biplane fighters before the war, and duri ng World War II, their Wildcat, Hellcat and Avenger proved to be outstanding Navy fighters and bombers. In fact, most of the Japanese aircraft shot down in World War II were shot down by Grumman planes. Republic, founded in 1931, built over 15,000 P-47 Thunderbolts during World War II, the Army Air Corps' outstanding mainstay fighter in Europe. Other companies in Long Island contributing to the war effort were Sperry, Brewster, Ranger, and Columbia. After the war, Grumman continued its tradition of producing Navy fighters as they developed the jet-powered Panther, Tiger and Intruder in the 1940s and 50s. Grumman fighter bombers saw widespread and successful use in both the Korean and Vietnam Wars. In the 1940s Republic also turned to jet fighter-bombers as they produced the Thunderjet, and in the 1950s the huge Thunderchief. These aircraft also saw a great deal of combat in Korea and Vietnam. In the 1960s Grumman production centered around building the Lunar module for the Apollo program. In the 1970s and 80s Grumman aircraft continued to dominate the Naval aircraft inventory. Grumman's E-2C Hawkeye, still in production, is the Navy's most advanced early warning aircraft, while their F-14 Tomcat is probably the best Navy fighter ever built. Grumman also produced the Intruder in several different versions for bomber, refueling and electronic warfare use. In the 1970s Republic produced the A-10 Thunderbolt II, proven by the Gulf War to be the greatest tank killing aircraft ever built. Thus Long Island has been involved with, and made major contributions, American aviation since its earliest days and it will probably do so for well into the foreseeable future. Although no more aircraft are being built here in their entirety, today approximately 240 companies remain on Long Island producing a wide variety of parts for virtually every American aircraft that flies. This is a legacy of which we can all be proud.